Pharmaceutical Industry at A Glance in 2015-2016. India's pharmaceutical industry will touch US$ 45 billion by 2020 according to industry experts. The Indian pharmaceuticals market increased at a CAGR of 17.46 per cent in 2015 from US$ 6 billion in 2005 and is expected to expand at a CAGR of 15.92 per cent to US$ 55 billion by 2020. By 2020, India is likely to be among the top three pharmaceutical markets by incremental growth and sixth largest market globally in absolute size. The Indian pharmaceuticals industry is the third largest in terms of volume and thirteenth largest in terms of value. India is the largest provider of generic drugs globally with the Indian generics accounting for 20 per cent of global exports in terms of volume. The Indian pharma industry, which is expected to grow over 15 per cent per annum between 2015 and 2020, will outperform the global pharma industry, which is set to grow at an annual rate of 5 per cent between the same period. 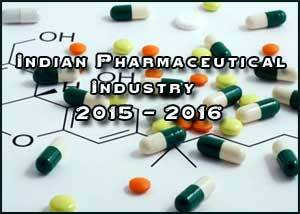 Presently the market size of the pharmaceutical industry in India stands at US$ 20 billion. Biopharma, comprising vaccines, therapeutics and diagnostics, is the largest sub-sector of the Indian pharmaceutical industry contributing nearly 62 per cent of the total revenues at Rs 12,600 crore (US$ 1.9 billion). The drugs and pharmaceuticals sector attracted cumulative FDI inflows worth US$ 13.45 billion between April 2000 and December 2015, according to data released by the Department of Industrial Policy and Promotion (DIPP). The Indian pharmaceutical market size is expected to grow to US$ 100 billion by 2025.